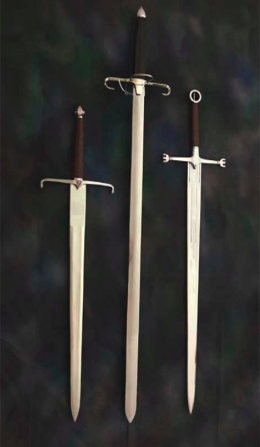 A: Bruce Two Handed Sword- a classic hand and a half sword or claymore. A double edged blade of solid steel, with a long ricasso and a broad fuller cross section that continues down much of its length. It also features a gentle taper. The wide guard has straight quillons, capped with downward curved tips, and also features a small shield placard at its center. The hilt is wrapped in crisscross leather, and the tip of the hilt is finished off with an unadorned scent stopper pommel. B: Based on a blade that was reported to have been wielded by the real William Wallace in the Battle of Stirling Bridge and in the Battle of Falkirk, during the Wars of Scottish Independence. The massive length is one of the key feature for this powerful looking blade. The sword has a lenticular (gently curved) cross-section, on a long, straight-edged blade that is made entirely from high carbon steel. The tip of the blade quickly rounds off and tapers to a point, although given its size, this sword is more immediately a cutting weapon than a thrusting one. The unique guard features curled quillons and a round disc base, which connects to the brown leather-wrapped hilt. Standing at approximately 67 inches along, this blade is nothing if not massive. A: Robert the Bruce, King of Scots from 1306 until his death in 1329. Robert was one of the most famous warriors of his generation, eventually leading Scotland during the Wars of Scottish Independence against England. C: the Gallowglass were a class of elite mercenary warriors who were principally members of the Norse-Gaelic clans of Scotland between the mid 13th century and late 16th century. Irish gallowglass and kern. Drawing by Albrecht Dürer, 1521. This page was last modified on 6 June 2014, at 19:16.